“It’s my turn to give Nana her eye drops today!”, yelled Anthony, aged ten. “No it’s my turn…” his five years old brother vehemently shot back! Nana overheard her grandchildren bickering and braced herself as she prepared to get into the judge’s seat to sort out the ‘lawsuit’ that would soon be brought to her. She was pleasantly surprised when the kids did not turn up even after fifteen minutes. As she strained her ears to hear if they had stopped bickering, she overheard their peals of laughter. She smiled to herself and went back to her nap. “Nana! Look at what these kids are up to!” Her peaceful sleep was broken by Mrs. Seth, their neighbour who had held both the kids by their ears and was dragging them in. 2. Remove the cap of the eye drop bottle carefully ensuring that the tip does not touch anything. 3. You may sit/ stand / lie down. Tilt your head backwards if you are sitting or standing and look up. Use a mirror if you are putting the drops yourself. 4. Pull your lower eyelid away from your eye very gently to form a pouch. 5. Position the bottle vertically over this region. 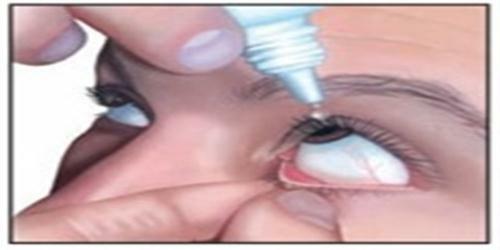 Squeeze the bottle gently and allow one drop to fall inside the lower eyelid. Look down, release your eyelid and close your eye.Do not squeeze or roll your eye around. 6. Press the inside corner of your closed eye with the tip of your index finger for at least two minutes. This minimizes the absorption of the eye drop from the tear duct, nose and throat into the blood by blocking the tear duct openings. Absorption of the drug into the blood may give rise to side effects depending on the drug in the eye drop. This also helps in keeping the eye drop in your eye where it is required. 7. After using the drops, wash your hands immediately, to remove any medication that may be remaining on them. • If your hands shake too much, you can approach your eyes from the sides so that you can rest your hand on your face to help steady it. • If you are not sure if the drop has gone into your eye, you may place the eye drop in the refrigerator (not freezer). When the cold drops go in you will be able to feel it and know for sure that it has gone in. • If you have trouble holding the eye drop bottle because it feels too small to hold, wrap a paper towel around it to make it wider. • If you need to put more than one drop, wait for five minutes between the two drops. This will prevent the second drop from washing the first drop out before it has done its work. • Keep all medicines out of the reach of children. • Follow your doctor’s instructions. Do not over medicate or under medicate on your own. • Ensure that your doctor knows about any other medication (aspirin, herbal supplements, vitamins) that you are consuming. Also inform about any allergies. • If you have been prescribed an eye ointment and eye drops both, use the eye drops first. • Throw out the bottle after the recommended time. This is usually four weeks after you have broken open the seal. Anthony was happy ‘coz he got to use the bottle everyday now! But it was Nana’s Ophthalmologist who was the happiest when he saw that the drops had begun to help Nana’s Glaucoma better than before, now that they were actually going in every time.